The first time I crossed it, I couldn’t quite believe my eyes. A little after I’d embarked on my quest to capture Chennai through miniatures, I was on one of my many visits around the city – and sure enough, once I was past the Chennai Central Station, beyond Ripon Building, Siddique Sarai and the Metro Rail works (with huge cranes looming over me) … I almost turned away, craning at Victoria Memorial Hall on the right, when something to my left flashed in the corner of my eye. A horse. Under a shack. Munching placidly on straw. There were streamers flowing down its head and it swished its white tail gently. Nearby stood a couple of other horses, and – a chariot. 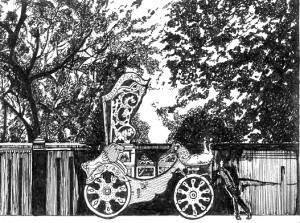 An honest-to-God chariot, painted in gilt to within an inch of its life. Apparently it was being readied for some sort of public function, for the fluttering streamers and buntings were being given a final polish (and the glitter-papers sticking out smoothed out in vain). Entering into conversation with some of those working on the decorations, I discovered that both horses and chariots were indeed available for rent; the public at large wasn’t aware that these were the last remnants of a British Raj era mode of travel. Now run by S. Kumar, President of Chennai Kudhirai Savari Thozhilalargal Nala Sangam – Viduthalai Munnetram, the business had originally been started by his grandfather (who, he claims ) was an Englishman by name Francis. A very quaint sight, and one that brings back a whiff of almost a century ago. Details about the miniature: Black and White; Pen and Ink. Dimensions: Approximately: 3.5″ X 5″.